AT&T is doing away with the 1000 message plan @ $10.00 which applies to all users who text. Now, AT&T customers will only have one message plan option: unlimited messaging at $20.00. The vast majority of our messaging customers prefer unlimited plans and with text messaging growth stronger than ever, that number continues to climb among new customers. In an attempt to simplify our messaging portfolio, the corporate direction is to eliminate our Messaging 1000 feature. Beginning effective 8-21-11, we will be implementing a company-wide messaging portfolio change. These changes will impact all customers including CRU, IRU, and Consumer. 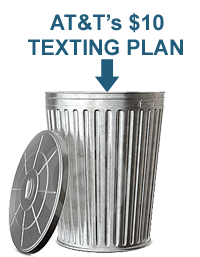 Messaging 1000 $10/1000 Message plan ($0.10 per additional message) will be eliminated Aug 21(MSG10)/Sept 7(DTXT) due to increased interest for unlimited plans. Existing Accounts – AT&T contractually obligated via MRC modifiers or National Account Credits in the 3 messaging families – Messaging 1000, Text messaging & Multimedia messaging: Those existing subscribers who currently have it as a feature will continue to have it after Aug 21(MSG10)/Sept 7(DTXT). New subscribers in this category adding this feature will continue have it available. Those existing subscribers who currently have it as a feature will continue to have it after Aug 21(MSG10)/Sept 7(DTXT). New subscribers in this category adding this feature will NOT have it available. First, where was the increased interest for unlimited plans? We would love to hear the data on this AND if there is data to support it, why not still continue to offer several options? Our business users use an average of about 534 text messages per month. This would have been addressed by the $10 plan. Why the increase for folks like this? Of course, besides increasing average revenue per unit? Second, it seems so perplexing that responding to interest in one thing results in the elimination of another. It is like Fords when they first came out: any color as long as its black. The difference is that Ford actually increased its color portfolio as time went on, not decreased its options. The one thing that is good is that current customers who has access to this plan for now will be grandfathered and new subscribers for these customers will also have this feature available to them. Digital Trends made a great point when they said, “We can think of no good reason for this hike, except to enhance profits. Though carriers routinely charge at least 20 cents per text, texting actually costs carriers next to nothing. In reality, sending a text is equivalent to sending a few bytes through the air. If carriers like AT&T wanted to be fair to customers, they would wrap this service right into their data plans, which have also been rising in priceas of late. Effective immediately, corporate services on select text messaging plans (Pay Per Use, 200/500/1000/1500 message plans) will now receive a high usage SMS and/or e-mail notifications at $50, $100 and $200 in un-billed text messaging charges. At $800, they will be sent SMS and/or e-mail notification advising that messaging service has been restricted. And of course, every cloud has a silver lining: if you add the Unlimited Messaging plan, you will also have the enhancement feature of Mobile to Any Mobile (MTM) minutes being added. This means that as the unlimited plan is added, you will need to do nothing and the unlimited Mobile-to-any-mobile feature will be automatically added. This will allow you to call any other mobile carrier from your wireless device and it will pull the minutes from your MTM minutes instead of your peak minutes pool. This could lower your cost if managed properly. Beginning August 23, 2011, AT&T1 is enhancing our AT&T Messaging Unlimited with Mobile to Any Mobile Calling. Customers will no longer have to manually add this feature to get the benefits that this feature provides. Starting on August 23rd and continuing through October, Consumer, IRU, and CRU customers with certain messaging unlimited features will be part of a sweep to have their current feature replaced with one of the Messaging Unlimited with Mobile to Any Mobile (M2AM) features. There will be no price change and we are increasing the benefits we offer our customers by offering them messaging unlimited AND unlimited calling to any mobile number. The sweep will take place on the customer’s bill cycle date to prevent proration of any charges for the old and new feature. Customers will be notified of this change. MSG3 is the $20 unlimited messaging feature for individual and Pooled plans which will be replaced with MSGM2AMUN which is the Single Line $20 feature and gives the customer messaging unlimited AND M2AM. Customers must be on a rate plan $39.99 or higher to qualify for this change. MSG7 is the $20 expired unlimited messaging feature for iPhones and will be replaced with MSG7M2AM which is the Single Line $20 feature which gives the customer messaging unlimited AND M2AM. Customers must be on a rate plan $39.99 or higher to qualify for this change. MSG4 is the $30 Family Talk/BusinessTalk 1 to 5 user account level features and it will be replaced with MSGFTM2AM which gives the customer messaging unlimited AND M2AM. To qualify, the customer must be on a rate plan $69.99 or higher. Restrictions include: BusinessTalk customers with MSG3 (the $20 single line feature) do not qualify for the sweep. They must have the BAN level feature to qualify for the sweep. Customer can at anytime change their feature to the Messaging Unlimited with Mobile to Any Mobile feature by removing the single line feature and adding MSGFTM2AM FamilyTalk feature. This would allow all lines (BusinessTalk $60-$140) on the BusinessTalk account to take advantage of the Messaging Unlimited as well as M2AM. When: Beginning August 23, 2011 through October 31, 2011. Customer Benefits: BusinessTalk and Pooled customers will no longer need to manually change their messaging feature to obtain the benefits of Mobile to Any Mobile calling. For additional details please reach out to your AT&T Mobility – Mobility Service Manager. I think this is ridiculous. I’ve had Captivate for almost a year. I was intimidated by smartphones and didn’t like the texting, but I adore this phone and wouldn’t want an upgrade at this point. The whole unlimited messaged though is terrible. Why should everyone signing up from that point on be forced to choose unlimited? I had the 15,000msgs for $15 which was perfect. I traveled alot late summer and used my Data and Msng alot. That was my only overage on either of the two, but I was using GPS and internet alot, plus texting the people I knew in the area I was traveling through. So now I find I’m stuck with unlimited, forced to have unlimited when I don’t need anything close to that now! I’m not happy about this and I’m starting to think about cancelling my service with ATT to prove a point. What AT&T is doing is very sneaky. I had the unlimited plan, but AT&T automatically changed it to the unlimited messaging plan with unlimited mobile to mobile, and sent me an email. While comparing the 2 plans ( understanding that businesses are in business to make as profit as possible), one thing seemed very different between the plans. The old $30 plan included unlimited incoming texts from international numbers, while the new One is limited to texts within their coverage area….very sneaky, given that there are very many international students in this country. I’m sure that’s an important detail to them. Of course I immediately switched back to my original plan before my “grandfather” option expired. The reason they did it is that the Apple’s iOS5 , which came out yesterday, uses the data plan to send most text messages so you don’t get charged for them. ATT knew this would lead to people dropping their $10 plan for the $5 so they eliminate all but the $20. I realized this when I downloaded iOS5 this morning, and then called ATT to drop my messaging to the $5 plan and was told they only had the $20 now. This is just another attempt for AT&T to scam their customers and increase profits. This is totally unfair to charge customers who do little texting to overcharge them for this service by making the unlimited plan the only option. Texting charges are just another scam for all of the carriers to make obscene amounts of extra money they don’t deserve. I am a true believer in what goes around comes around, and AT&T, I hope your current customers who don’t need to pay $20 per month for texting drop you right and left, and you will be exposed for being the greedy bastards you are!